Spring 2016-Fall 2017. 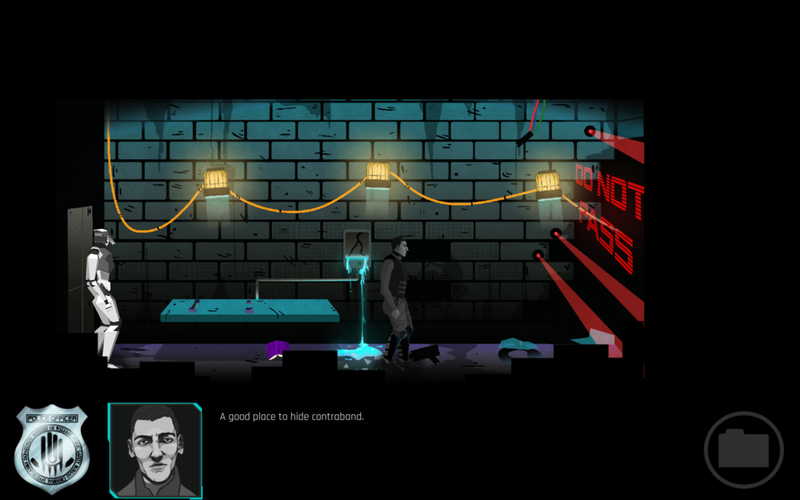 Cyberpunk investigation point and click game. Developed by Good Morning Games. Presented at GCS Spring Showcase. Hardwired has you take on the role of an investigator working to solve a prison escape case in an authoritarian state. The game combines investigation with an innovative ideology scale and dialogue system. My Roles. Game Design: I defined and iterated on the mechanics. Narrative Design: I headed content design and writing, and complemented that through Character Design. Production: I managed the project for the year of its duration, as an independent study under Paolo Pedercini and GCS Project that following spring. Good Morning Games: Andrew Chang, Kate Chaudoin, Adela Kapuscinska, Aidan Peck, Sofia Miren Syjuco, Joseph Yankel. With help from: Yuan Jiang, Yitong Li, Kathleen Ruan. Our group strove to create a dialogue-driven game that would combine investigation mechanics with in-game political stakes, intrigue and dissent. Thus, Hardwired pitches the players in a position of authority - a police officer brought onto a new case and immediately mired down in the aftermath of a prison escape. Cyberpunk was the ideal environment for us to explore dynamics of power, control, censorship and accessibility of information. • To create a meaningful branching narrative. It was crucial to us to show that player dialogue decisions matter, and that following specific ideological threads is binding. • To explore grey morality, with nuance. We set out to create our own version of a grey morality scale, within the premise of the "friend or foe" mentality. • To pit players against reactive NPCs. All characters met by the protagonist fall on the same morality scale, and react accordingly. • To create a critical, relevant and compelling narrative. Police violence is a serious matter, and we strived to create a game that would be in conversation with current events. Investigation The primary objective in Hardwired is the investigation into the prison escape of the notorious Rebellion leader, Gaius. However, the player has to do so within the scope of their officer rank, where attempts to pass their clearance will be viewed with suspicion. 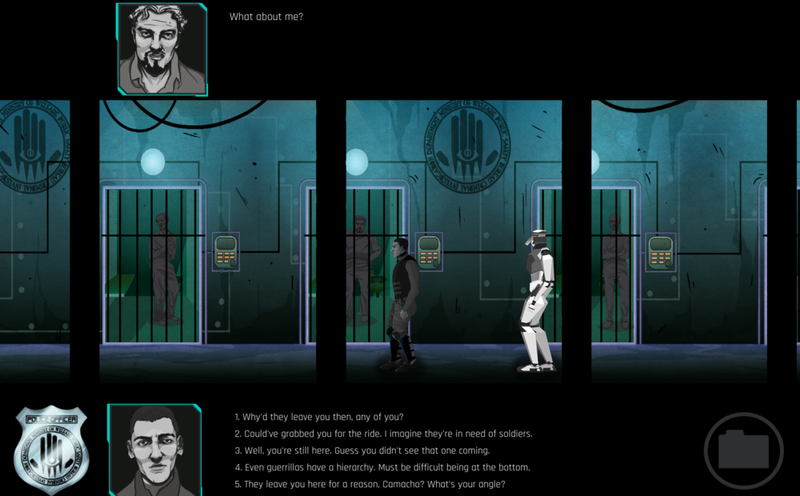 Players can interview their colleagues or interrogate prisoners, find environmental clues, and use the Gaius file - the physical representation of their investigation - to pave the way towards understanding who their target and the ideologies surrounding them are. At their current clearance level, the player knows close to nothing about their target. The Gaius File to update as the investigation progresses and new information is acquired. Characters With investigation being a largely isolating practice, we knew we needed to surround the player with a diverse cast of characters that are representative of the facets of the political system within which they exist. The player needs to take into account the tactics they use, as they are under the constant scrutiny of their peers. Ideology Scale In an authoritarian regime, you are either friend or foe. We wanted to capture the fragility of one's political existence, by integrating a comprehensive gradation of dialogue options (altogether 5) with a reactive ideology scale. This is key to the innovation of Hardwired. • Reflect on the protagonist's overt ideological position. The environment and NPCs are responsive to the player's choices and will either react positively, neutrally or negatively to queries. • Affect the dialogue options available. 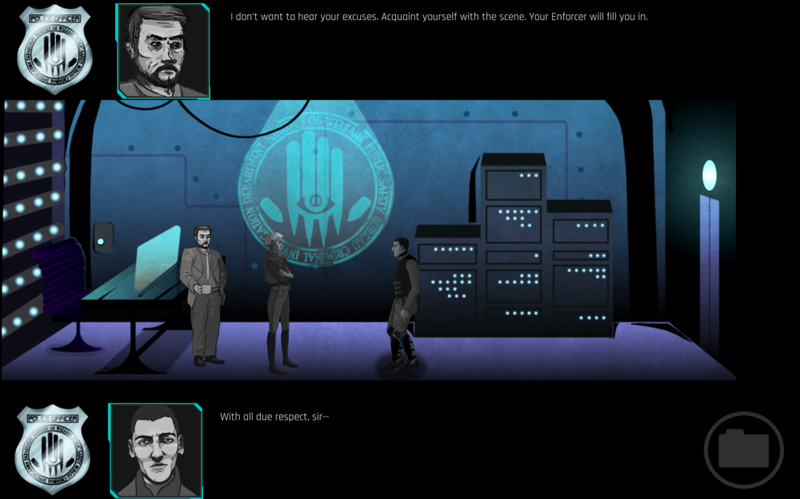 The dialogue system follows the concept of varying ideological flexibility and enforces that idea through limiting options (as seen in the Dialogue Visualization graphic). • Generate their discernible future. The game takes into account the dedication with which the player pursues a specific ideological zone, especially extremities (Law Bringing or Dissenter), and makes it harder to recover from those zones.